Behavioural training in kindergarten is a universal prevention program to promote emotional and social competence. It is aimed at children aged three to six. The children learn in the game to discover feelings with themselves and with others and to manage conflicts in everyday life better. They deal with typical conflicts from everyday kindergarten, test positive behavior in role-playing games and thus expand their skills in social situations. The training is designed according to age and motivates the children to actively participate by appealing material. For this purpose, leading figures (dolphin Finn, Sina and Benny) are used to help to work on their own problems. Training in kindergarten is suitable for creating a better learning atmosphere in the group and reducing the first signs of behavioural problems in children. 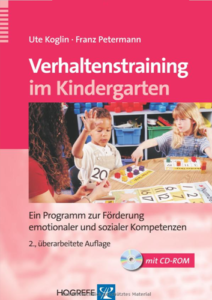 The reworking takes into account current results on the emotional development of children as well as on the effectiveness of the training and provides additional information on how to carry out the training program in kindergarten. Image materials and worksheets for carrying out the training can be printed directly by the enclosed CD-ROM. With the help of behavioural training in kindergarten, the emotional and social skills of children aged three to six can be promoted. ← On a treasure hunt – An adventure with Ferdi and his friends.